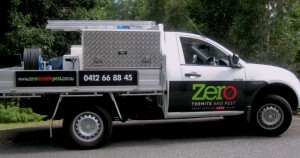 Call Zero Termite & Pest Sunshine Coast today and get your obligation FREE quote! Zero Termite and Pest provide professional Termite and Pest Solutions to the Sunshine Coast, Hinterlands and surrounding areas. We undertake every job as if it were our own home. We ensure every job is done with the utmost professionalism, using safe quality material. All our staff are police checked and turn up on time every time. We complete all projects with integrity and fairness. We strive to offer the Sunshine Coast an honest and reliable service. We keep up to date with the latest innovations and improvements in Pest Management technologies. We keep up with educating our clients about the risks and preventions involved in the Pest Industry. 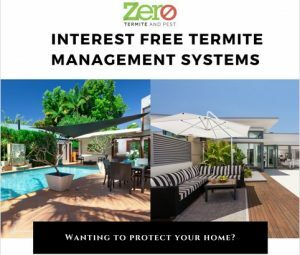 Zero Termite and Pest is a family owned and operated business servicing residential and commercial businesses on the Sunshine Coast and beyond. We have many years experience in the Termite and Pest Industry having previously owned Jim’s Pest Control Sunshine Coast. 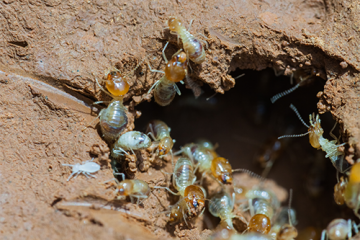 Zero Termite and Pest understand that most households don’t budget for a Termite Management System. This is why we have teamed up with Ezy-Pay to offer our clients the option to pay off their Termite Management System over 12 or 24 months. If you would like to know more about our interest-free payment plans please contact us today. 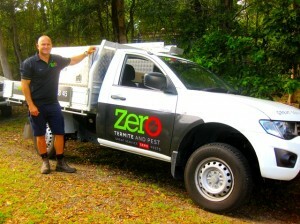 Zero Termite & Pest, Sunshine Coast and surrounding areas offering specialist termite control and removal services. Zero Termite & Pest provide a valuable pre-purchase and pest inspection service on any new or existing homes on the Sunshine Coast and surrounding area prior to purchasing. As manager of the only five star accommodation resort in Caloundra it is imperative that any contractors visiting our site do so with professionalism and have an ability to deliver on the agreed work within the timeframes promised. This resort has contracted Michael Kinnear of Zero Termite and Pest for the past 2 years to conduct treatment on behalf of both the residential and commercial bodies corporate. My husband and I have used Mick with Zero Termite & Pest quite a few times in our properties over the last few years. Mick has always been reliable, showed up on time, and explained everything very clearly to us. Mick has a passion for "pest busting" and I feel comfortable knowing that I have someone in the local area who I trust to get the job done. I would not hesitate to recommend Mick at Zero Termite & Pest. Owning a dog is a big decision. Especially when you have kids in the family. Find out which are the most suitable family friendly dogs in our comprehensive guide! Learn about the current trends and statistics on fireplaces in new homes, and see if a house plan with an indoor or outdoor fireplace is right for you. Relocating overseas? Thinking about making a new life for yourself abroad? There’s a lot to consider including a big adjustment to local customs.